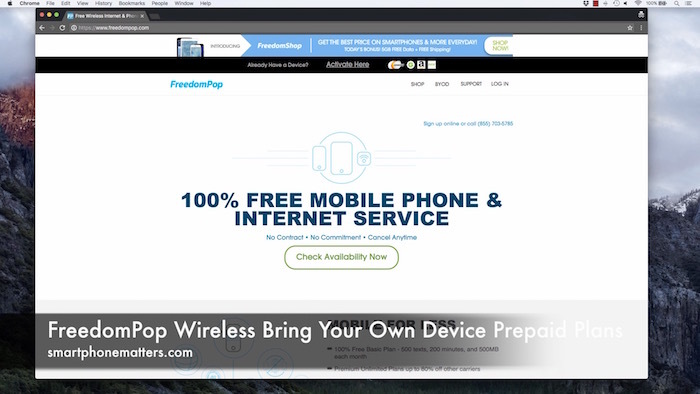 In this series of articles and videos, I’m going to take a look at FreedomPop. Freedom Pop is a prepaid wireless company that offers both free and affordable premium cell phone service as well as wireless internet plans. I recently signed up for there new 4G LTE cellular service and I’m going to share with you what I’ve learned. So I thought I’d start by taking a look at freedompop.com. I’ll note here that you can earn free data by referring friends and unlimited data by completing partner offers. It also says they have unlimited premium plans up to 80% off. But if you scroll down the page, they don’t seem to list the plans here. The rest of the page tell us that they sell discounted name-brand smartphones, BYOP and Free Phone Service, followed by a description of Mobile Broadband and Wireless Internet. If you look in the Free Phone Service section you’ll see they have a FreedomPop’s $19.99 per month, unlimited talk, text, and 1GB data plan. Now I looked around and I couldn’t find a list of their plans anywhere. I finally out the plans details, let me show you. From the top page, click Check Availability. Next they ask for you zip code and email. They don’t need your email to check availability, they just are collecting it for marketing. Next the ask for your street address. Now you need to select mobile phone, a sim kit, a mobile hotspot, or tablet. I selected Sim kit and then choose 4G LTE SIM card. FreedomPop like many other prepaid wireless companies, offers service on the Sprint, T-Mobile, and now AT&T networks. This SIM uses AT&T LTE network. I also wanted to show you that FreedomPop offers additional plans. If you log into your account and look under My Account > Plans we see they have additional monthly plans. The Premium 4GB LTE Unlimited plan for $44 seems to be pretty close in price to what other prepaid wireless services offer. The Premium 3GB LTE Unlimited is better deal than average. However the Premium 500MB LTE Unlimited, Premium 1GB LTE Unlimited and Premium 2GB LTE Unlimited all appear to be very good values. In the next part of this series, I’ll show you the FreedomPop SIM kit and set up my iPhone and Android Phone.